MADRID — Diego Simeone refused to be downhearted by Atletico Madrid’s slim chances of making the Champions League last 16 after Antoine Griezmann returned to form with a stunning overhead kick and assist for Kevin Gameiro to beat Roma 2-0 on Wednesday. Twice finalists in the past four seasons, Simeone’s men still need a minor miracle in the final two games in Group C on December 5 to progress as Atletico need to win away to Chelsea and hope Roma drop points at home to Qarabag. "There is still one game to go and, until the 90 minutes are over, we can’t think negatively," said Simeone. "I always have confidence because I know my players and they will give their maximum until the situation leaves us with no chance." Chelsea swept aside 10-man Qarabag 4-0 in Baku on Wednesday to secure their place in the knockout phase and move ahead of Roma into pole position to win the group. However, having been held twice by the Azerbaijani champions, Simeone believes they can cause an upset in the Italian capital. "You can’t underestimate anyone," added Simeone. "Football is marvellous. Sometimes the ball wants to go in and sometimes not. "Today Chelsea attacked once in the first half and it was a penalty and a sending-off." Yet, even if progress to the last 16 for a fifth consecutive season is beyond them, Atletico did end a five-match winless streak at their new Wanda Metropolitano stadium and guarantee at least a place in the Europa League with a well-deserved victory over the Italians. In a story of their season, Los Rojiblancos had lacked inspiration in the final third before Griezmann ended his eight-game goal drought in spectacular fashion by acrobatically thrashing home Angel Correa’s cross 21 minutes from time. Griezmann had been jeered by some Atletico supporters when he was substituted in Saturday’s 0-0 draw at home to Real Madrid. However, he was backed throughout as his name was chanted before kick-off. Griezmann then turned provider with a fine through ball for Gameiro to round Alisson in the Roma goal and slot into an empty net five minutes from time. "We are all behind him because scoring goals like that, he makes us win games," said Gameiro. "I think he is a little relieved, like everyone else." 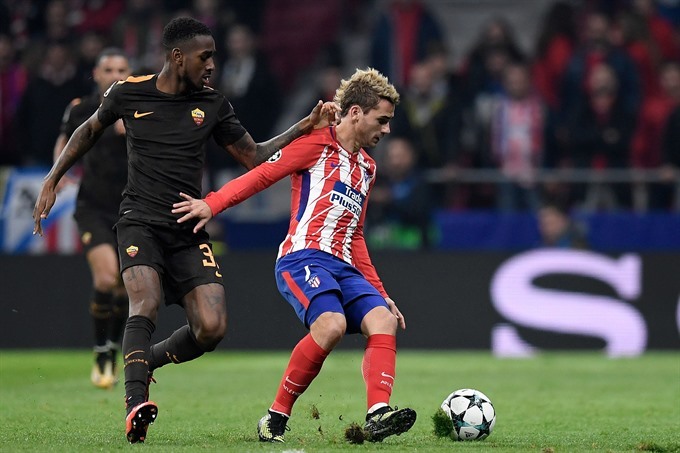 Roma boss Eusebio Di Francesco admitted Atletico were deserving winners on the night, but insisted he would have been delighted with having Roma’s fate in their own hands going into the final game when they were handed a tough draw back in August. "We would all have signed up for having to win our last game at home to Qarabag to go through," said Di Francesco.